In Brazil, government inspectors from the Ministry of Labour have freed 849 workers being held in conditions of slavery on a coffee farm near Barreiras in the state of Bahia. So far this year inspectors have freed more than 2,000 workers from forced labour, mostly in the Amazon region. In March, the government announced a plan to eradicate slave labour in Brazil. Government inspectors who had been tipped off by a local politician raided a coffee farm in Bahia. They say it is unprecedented to free so many workers in a single operation. The workers were forced to live in makeshift shelters which provided little protection from the heat and the rain. Over 70 of them were ill. The inspectors ordered the farmer to pay the workers everything he owed them and then arrange transport for them back to their home region. 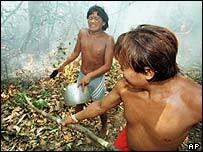 Most slave labourers are used to clear forest on Amazon cattle ranches. Earlier this year, the government announced a raft of initiatives to stamp out the practice. These included increasing the number of inspectors and measures to ensure that farmers found with slave labour on their properties should not only be forced to pay them compensation but would go to prison. The problem is that many of those who have recruited workers and treated them as forced labour are influential ranchers. Some of them have even been elected to public office. And in the poor regions of north-east Brazil, where most of the workers come from, unemployment and poverty mean that there is always a large army of desperate people easily persuaded to try their luck hundreds of miles away.